You possibly have to be of a certain age to remember it, but this song has followed me gently down the years and — in the way some songs do — randomly popped up centre stage last weekend. I was poised to take my coldest swim yet, in water measuring somewhere between 1.2C and 1.5C, when the late Kate McGarrigle and her sister Anna arrived in my consciousness, along with their distinctive banjo and accordion. Clearly, it wasn’t summer, or anything like. It was early March at the end of the coldest week of the winter, but the rest did apply: I did hold my breath, just for a moment, before squealing a great deal, and then kicking my feet and moving my arms around. A whole gang of us had stood at the edge of Bray Lake, our joking masking our tight focus as we pivoted between courage, curiosity, and fear before venturing into water still well punctuated by sheets of ice. We knew, because we’ve all of us been doing this for a while, that you don’t mess with cold water. And you really, really don’t mess with 1.2C water, no matter how great the photo opportunities. None of us — including our two awesome official ice milers — had swum in water quite this cold before and few of us managed much more than five or six minutes before overriding the euphoria and heading back indoors. And it is euphoric: we were as high as kites as we quickly posed with our chunks of ice, kicked our feet, moved our arms, and shared an exquisite moment that we knew wouldn’t come round again any time soon. We toasted our milestone with tea, coffee, hot chocolate and crumpets. But not content with that experience, I felt compelled to add another. 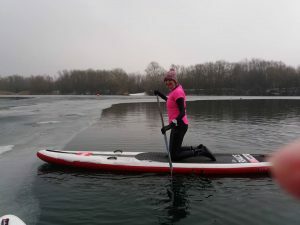 After I’d warmed up, I put on wetsuit, neoprene boots and gloves and ventured out on a paddleboard, at first just gingerly navigating around the ice in one corner of the lake and being very, very careful not to fall in — a time and a place, and I done enough of that for one day. Slowly though my training partner and I got a little bolder and we began carving our way through the ice, kneeling on our boards and using them as ice-breakers to make the whole lake accessible. Our focus was absolute; we played it like polar explorers. Fun, a little risky, and entirely surreal — in fact, I’m prepared to say that’s likely to be the most surreal SUP experience we’ll either of us have for quite some time and it perfectly rounded off an absolute belter of a stand-out morning. A few people have said this was pretty bonkers, and quite a few more than I’m brave. 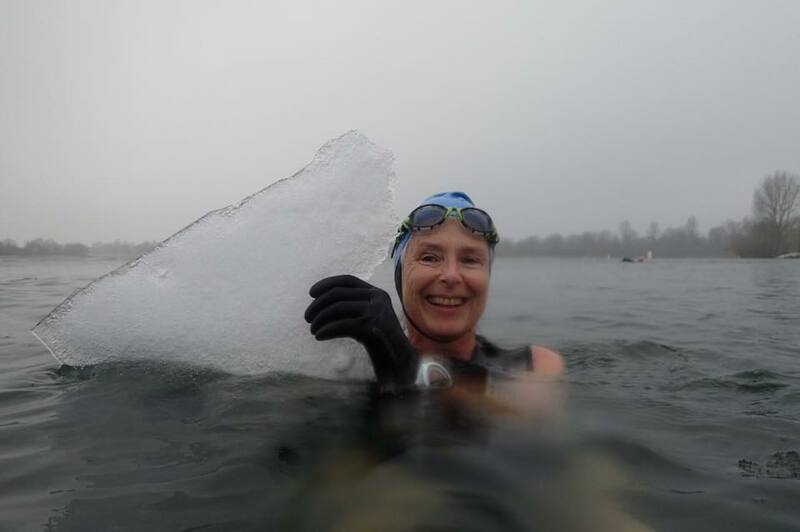 But all I have done is get my body and my mind accustomed to the cold — this is my third open water winter — and stepped (quite literally) outside my comfort zone a little so that when the opportunity arose to give my limits an extra push, I was ready to take it. What this shows more than anything, I believe, is that you don’t need to be exceptional to experience something exceptional — it starts with the desire to venture somewhere new. Brrrr that looks cold! I’ve wondered whether to try paddle boarding. I surf, but am bad at it, I love boogie boarding!